Our state-of-the-art services remedy the problem quickly for you. You’re wise to to work with a plumber on your clogged drain. Did you know that while that name brand cleaner you get at the grocery store temporarily speeds the drain time up, it can permanently damage your pipes and cause corrosion? This can lead to extensive (and expensive) repairs. 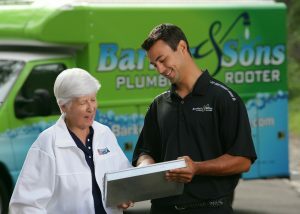 At Barker & Sons Plumbing, we’re drain experts. Our professionals use the latest technology to properly clear and repair any drain or sewer pipe. We clean drains, remove clogs, repair sewer pipes, retrieve wedding rings…the list goes on! And we don’t just clear your drains, we clean them, which helps prevent future backups that can cause major damage and insurance repair. Whether it’s your kitchen sink, shower, tub, toilet, laundry or main sewer line we offer the latest in drain cleaning technology to clear even the worst clogs caused by grease, debris, sludge, or tree roots. By using a sewer cleaning process called Hydro jetting, we can clean open and enclosed areas (even those that are difficult to access), and destroy the most stubborn line blockages. The ultra-high water pressure used with Hydro jetting literally scours the walls of the drain and sewer line, cutting roots, grease and debris along the way. It is both environmentally safe and economical. Simply put, there is no better way to get your pipes draining as well as the day they were installed, short of replacing them completely. We also offer video camera inspections of sewer lines to get to the root of the problem. We are able to insert a camera after we have cleared the stoppage to visually inspect your drain system. If a drain or sewer pipe has been broken, offset, collapsed, or has large root infestations, we offer a state-of-the art ‘no dig’ sewer relining system to completely rehabilitate and restore your pipes preventing damage to your yard or driveway.